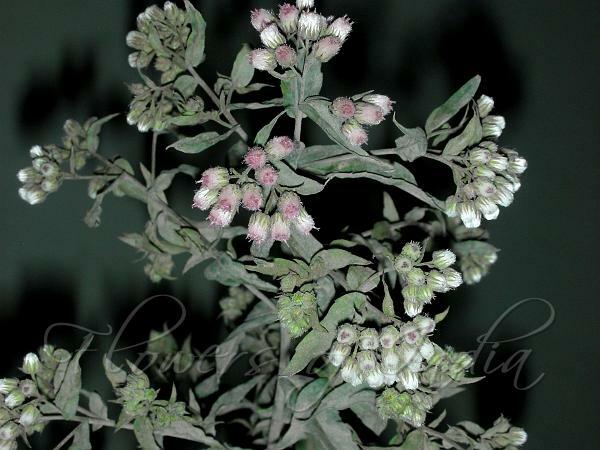 White-Flowered Fleabane is an annual herb, with stems erect, 1-5 ft tall. Leaves are stalkless, lanceshaped, 7-10 cm long, 1.2-1.8 cm wide, margins minutely toothed, upper surface darker, both surfaces densely covered in minute yellow glandular hairs. Inflorescence is a rounded panicle of whitish flower-heads which are broad-bell-shaped to spherical, 5-6 mm long, 5-7 mm diameter. Involucral bracts are rusty velvety with paler margins. Florets are reddish; marginal florets many, threadlike; inner florets about 4. Achenes are ovoid, sparsely hairy with thickened margins; pappus of many cream to purplish fine barbellate bristles about 3 mm long. 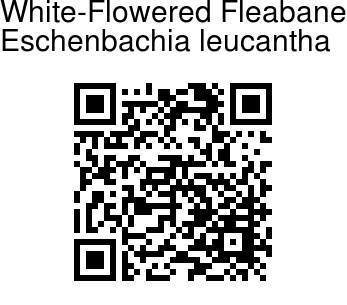 White-Flowered Fleabane is found in the Himalayas, Shimla eastwards to Burma, Malaya, Thailand, Indo-China, China, Philippines, Java, New Caledonia, Australia, at altitudes of 700-1200 m. Flowering: December-March.